Quick distance readings and advanced calculations are at your fingertips. Connect to a smartphone or tablet to overlay measurements on a photo or sketch to share with others. Clearly view measurements on the large, backlit, 4-line display. 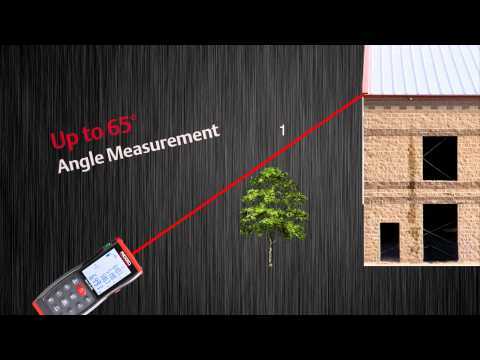 Inclination angle measurement allows indirect measurements for hard to reach areas. Adjust units instantly to inches, feet or meters. Bluetooth® connection to smartphones and tablets to view, store, and share data. Android® and iOS® Apps to overlay measurements onto a photo or sketch. RIDGIDSketch™ is a tool for mobile devices that allows you to calculate and communicate measurements of your project. It can be used on its own or in conjunction with a RIDGID LM-400 Laser Distance Meter. The app will connect to your LM-400 via Bluetooth® and wirelessly receive the exact measurements from the device. RIDGIDSketch™ works in both drawing mode and photo overlay mode allowing you to develop precise room plans or annotate measurements within a photo. micro LM-400 Advanced Laser Distance Meter is rated 4.5 out of 5 by 8. Rated 3 out of 5 by BritReese from Unable to connect Bluetooth I bought this tool because I found the Ridgid Sketch App first. The App itself is awesome and the features are great tools What I do not like is that I can not get this unit to pair with.....anything. Two different iPads - 3 different iPhones. Nothing. So I have to read back on its list of measurements and then manually add them to your “sketch”. Essentially, this thing is a brick to me...a $192 brick. I reached out to Ridgid support, I have received ZERO response, this is upsetting, as I have purchased just about every 18v tool or stationary wood working tool that Ridgid has produced. Rated 5 out of 5 by Michira from Its a great product My side button stopped working two days after purchase, trying to reach RIGID for a replacement, I hope they will respond. Rated 5 out of 5 by Freetooler from A very good tool for interior measurements. The screen shows which measurements to take as you go through the steps for square, cubic and height. I was able to use the tool accurately within a few minutes. Rated 4 out of 5 by venados from It is one product interesting I need to measur angles planes also, It device only measure angles up. Rated 4 out of 5 by grady95035 from The tool feature packed, software needs work The product itself is good and packed with features costing more on competitive products. The software, Rigid Sketch, could be the differentiator for this product with some minor improvements. First off, the measurements are rounded and displayed to the nearest inch despite the tools ability to measure within 1/16th. File management of drawings is non existent and editing drawings is awkward and often impossible. I have spoken to tech support and they are making an internal request to fix the display accuracy. Leica provides a tool that provides the display accuracy but fails to scale the drawing as dimensions are added. As a stand alone tool, 5 stars. If you plan to use Bluetooth to transfer dimensions to Rigid Sketch, unless an inch accuracy is close enough, you will find the tool useless. Rated 5 out of 5 by Tomika from Godd thing It's a good instrument, very easy to use. The Bluetoth data transfer works good, i like it. To send the measure dates to an Android phone is very easy. The Ridgid sketch program with the photo feature (sending measuring data on a photo) is excellent. Rated 5 out of 5 by makoskyj from Great product! Easy to use. Accurate and all around good product. Quality is durable and well made. Price is decent. Makes the job easier. Rated 5 out of 5 by GoPastTheLimit from Amazing Product I bought this product months ago and it has been the most accurate that I have ever purchased in the last ten years. It's very durable as I have dropped it many times but it definitely is a product to consider. Why do you build a laser measurement tool with accuracy to the 1/16th of an inch and provide a companion software tool that rounds measurements to the inch? This makes this nicely designed piece of software effectively useless for any form of construction. Are there plans to modify the tool such that accuracy to the 1/16th of an inch will be displayed?